"It was a really good story especially if you are an animal lover. I really loved the story line and the 4 main characters are also amusing and lovable. The pacing and the writing itself was also very good. However, it seems to be a similar to Harry Potter, only animal style. DIPI sounds like Hogwarts. Arno is like Harry, Leroy is Ron. A lot of potential for this series. I'm excited to read the next one. (4 stars)"
"Nice young adult story about a 13 year old boy named Arno Steele who has to face a family past that he was not aware off. Going to the prestigious DIPD academy where he is to learn how to hone his skills at "speaking" psychically with animals. Most people can speak to one or two species but Arno seems top be able to speak to all. Decent story seemed long on explanation but little action until you get towards the end. But as a first in the series it is a good start. Nice way to spend an afternoon in the sun. (3.5 stars)"
"A very entertaining read! I could compare this book to having a similar feel to either the Harry Potter or Percy Jackson books, but I believe this book is more enjoyable for me as it has an inspiring message with it in regards to ecology and animal rights. By the end of the book, I found myself wanting to re-read the story and also anticipating the follow-up book. (4 stars)"
"Although aimed towards younger teens, this novel can be quite entertaining for an older audience. Arno and his friends' escapades as well as Charlotte's sharp tongue will be sure to put a smile on the reader's face. In a world with refreshing concepts and practices, the heroes have depths that are only partly explored, while the villains are most definitely evil and quite gruesome. I am looking forward to the sequel and hope to learn more about Arno's mysterious teachers and the legend of the Truemore. A fun read! (4 stars)"
"This book contains a very new concept for a story: certain people talk with animals by means of special telekinesis powers. This power sets them apart from the majority of the citizens who don’t have this power. As always, the different guy becomes the heart or the hero of the story and in this case so it is with Arno. Not everyone in his birthplace can talk to animals and of those who do, most can only talk to one type of animal, maybe two, but in this story Arno, talks to many animals. Animaia is a great read, although it feels a bit slow at times. More dialogue would resolve that problem. It is interesting. I found no editing problems in it. It could be very well received by teen of all ages and adults alike. 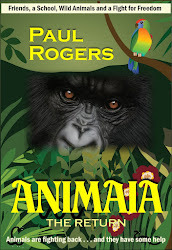 (4 stars)"
"A very entertaining book for the animal lover in us all. The concept of being able to "sync" with the animals is one I would have always wanted to be able to do. Great story. (3.5 stars )"